With about two days to go on its jaw-dropping Kickstarter campaign, Double Fine's next adventure game has acquired $US2.7 million in grassroots backing from fans like you. Double Fine's Tim Schafer provides a little perspective on the size of the kitty. "Um, people... three million dollars... that was the budget of Grim Fandango!" Schafer tweeted a couple of hours ago. "Holy cow, the next 52 hours are going to be exciting. We're looking into doing a livestream countdown," he added shortly after. There are 50 hours left to get in on the project. The game sought $US400,000 originally and has raised almost 700 per cent of its goal. Best thing is the cost of development on Grim included engine development. If this is on the Brutal engine then that cost is already removed from the equation. Additionally modern development techniques will also over come some of the more costly hurdles of game development 10-15 years ago. Then again, I heard rumours that the staff subsisted on gravel and pencil-shavings during Grim's development. The thousands wasted on ensuring staff can buy "food" would surely eat up a bit of the budget. Yeah, but they were Derwent™ pencil shavings. I mean, sure, they're pencil shavings, but they're like, top shelf shavings right there. 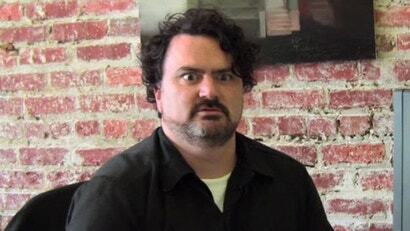 Why dos it look like Tim Schafer just saw epic bewbs? indeed. its like they told him they were handing him a cheque then led him into Scrooge Mcducks moneybin! It would be funny if this game ended up sucking. Maaaaan... I can't wait. I LOVED Grim Fandango. Sure, Psychonauts was good, but nowhere near the epic hilarity of GF. Manny was just such a likeable guy. And it was a pretty long story, too. To my ever undying shame I have never played GF. How does one go about playing it these days? You can get the game on Ebay (although it's sometimes expensive) and this link (http://grimfandangodeluxe.blogspot.com.au/2012/01/running-grim-fandango-on-modern.html) provides a great guide on how to get it running hassle free on modern PCs. There was a series of LucasArts Classics released on CD-ROM a few years back, including Grim Fandango, The Dig, Full Throttle, Sam and Max Hit the Road, and I think Monkey Island 3. They all went for around $10 each, and used to be all over the place. JB, Harvey Norman, etc. Dunno how common they are now though. But they just ran straight from the CD and everything. I subscribed pretty quickly to this project, but only put in enough to get the digital download. I was teetering on going as far as the special edition box. Then Tim threw in the t-shirt. Now, in a few days, I'll be $104.45 down in purchasing power. Assuming the dollar holds up. Most expensive t-shirt ever! It'll be worth it. Grim Fandango is my favourite game of all time, but I just recently replayed Full Throttle and am convinced it's nowhere near as appreciated as it should be. As short as it is, the storytelling prowess on display in FT is astonishing, and IMO, making it longer wouldn't have necessarily have made it better. $104.45 AUS = $110 US. At the moment, anyway. So don't worry, I've got my shipping costs covered. Agreed about Grim Fandango, and Day of the Tentacle also rates up there for me as well. Alas, I threw the boxes for these out years ago, so only the CDs remain in my collection. Oh when I was young and foolish ... wait, I still am. Clearly, this means that they should be using the money to make Grim Fandango 2!